The Belvedere Condominium in 2 sentences: The Belvedere is a massive community with a grandiose amenity package. Located just a short walk from the Rosslyn Metro, The Belvedere is known for its large floor plans, resort-style living, and convenient urban location. 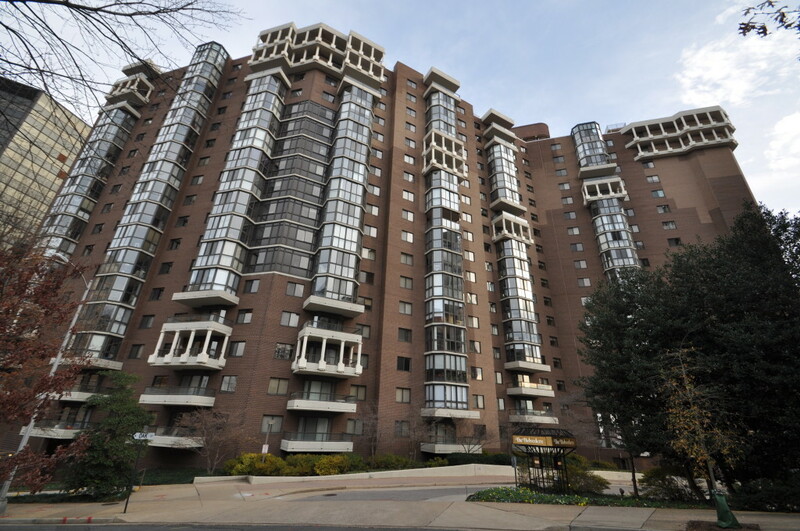 The Belvedere is a towering community located in the Rosslyn neighborhood of Arlington, VA. The community was built in 1987, stands 19 stories tall and contains 525 units. It is one of the largest populated condominium buildings in the Arlington condo circuit. From the outside, The Belvedere has a distinguishable look. The exterior is similar to that of Alta Vista in Ballston, which was built in the same era. However, differing its self from the Alta Vista, more condos at The Belvedere will have a balcony. The majority of Belvedere condos have the sunroom while a select few will feature the balcony. The lobby and common space upon entering the Belvedere is quite large as you would expect with a building of this size. The community is split into an East and a West tower. The front desk will great you at the main lobby 24 hours a day. In addition, there is also an outdoor pool, a fitness center, tennis courts, a convenience store, a community room, and a party room. The location is such that the community backs up into Route 50 providing unobstructed views for condos on higher floors. The southern view will lead to sights like the Iwo Jima Memorial, Potomac River, Washington Monument, and more. The clear downside of living above a highway is there will be pollution – both noise and environmental – as well as the fact that if you are on a lower floor, the view might not be that big of a draw. This will affect those who are on this specific side of the building. Those on the other side will get the Rosslyn city-view out of the sunroom or balcony. Floor plans at The Belvedere will range from one-bedroom layouts up to three-bedroom setups. One-bedrooms begin around 750 square feet. There are some one-bedroom layouts that have a den and top out at 945 square feet, but this is much more rare. Expect to see one-bedroom condos at The Belvedere Arlington hover around 750 – 870 square feet. The Belvedere excels at simply having larger layouts than comparable condos in Rosslyn. A good number of two-bedroom layouts will hit 1,400 square feet. The Belvedere is also known for having a lot of three-bedroom condos for sale. When you look at the Arlington condo market, it is tough to find condos that are over 1,500 square feet. Newer buildings will either 1) focus in on higher profit margins by simply only building one and two bedroom condos or 2) price their new-construction three-bedroom condo as you would expect, at the very highest the market can bare. Two things happen in this circumstance. The first is that The Belvedere’s larger floor plans are extremely coveted because they will still come in under new construction because of the age of the community. And the second thing that you may see at a building like The Belvedere in Rosslyn is because the acquisition price is steep to acquire oversized units, current owners of large units will purchase the condo next to their own, tear down a wall, and combine two units. The Belvedere has a lot to offer. The amenities are what we call ‘resort-style’ where there are so many of them that you do not really have to leave campus to take care of quite a few things. This also bodes well for the rentals in the building. Apartments for rent in Rosslyn is extremely competitive with all the rentals in the area and The Belvedere adds to that with its own condo rental stock. Many owners will rent out their unit after they have moved or will simply just buy their Belvedere condo with the intent to rent it out. Now even though there are a decent amount of rentals in The Belvedere Rosslyn, it does not feel anywhere close to an AirBnB (which is of course, illegal in condos), or dormitory, or apartment complex. The best parts about The Belvedere are its location, its seemingly-larger floor plans, emphasis on closet space, the large outdoor pool, potential for views, and 24-hour front desk. The downsides to The Belvedere are the proximity to Route 50, the age of the building (everyone wants new, but doesn’t want to pay new prices! ), and the layouts of some bedrooms may throw some people off-guard. The vanity in some master bedrooms is found in the hallway inside the master bedroom, instead of you know, the bathroom. I think this might be a little strange. But it’s subjective. You may think I am strange for thinking that this is strange. (But really guys, it’s kind of strange). Another important point to think about is that a lot of the condos for sale at The Belvedere Arlington that hit the market need updating. I decided not to put this as a pro or con because depending on how you see it, you could view it as an advantage. On the one hand, you get a clean slate and a discount on the sales price (money immediately put into renovation costs). But on the other side, finding a turnkey unit is a little more tricky. Sometimes the larger layouts two and three-bedroom layouts will have been updated and are more likely to be modern compared with the one-bedrooms. Again, it is all going to depend and it is just something to take note of. The Belvedere is going to check a lot of your boxes as you are looking at Arlington condos for sale. There are a few things to take into consideration, but they are minor at best. For condos in Rosslyn that have larger floor plans and lots of amenities (in an albeit much larger community), The Belvedere is certainly going to be a serious contender for the place that you decide to call home.